If you purchase a standby generator, please notify us so we can be aware of your location. We also highly encourage you to have your generator installed by a licensed electrician. Adding a standby generator to the electrical system of a home, farm or business requires a suitable transfer switch to disconnect the electric loads from the power supplier's utility grid. This is a requirement of the National Electrical Code (see NEC Article 702-6) and all electric power suppliers, for two very good reasons: (1) it prevents the back flow of current into the utility's lines during an outage, which could electrocute linemen working to restore power; and (2) it prevents damage to the generator when regular electric service has been restored, which can destroy the generator. 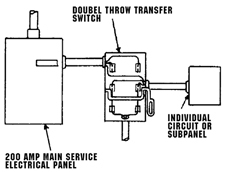 Figure 1: Typical Double-Pole, Double-Throw Transfer Switch Installation for 120/240 V, Single-Phase Service. Grounding electrode must be bonded according to National Electrical Code requirements and local regulations. For single-phase, 120/240 volt power, the transfer switch should be a double-pole, double-throw type. Double pole means that there are two pairs of wire lugs available for connection of hot conductors (see Figure 1). The third wire (neutral wire) is continuous through the transfer enclosure, and is typically not switched (NEC Article 230-83). The ground wire also passes through the switch enclosure to provide a safe and continuous ground connection. The term double-throw means that the operator can place or "throw" the switch into two different positions. One position feeds power from the utility system to the load. The other position feeds power from the standby generator to the load. Such a switch will prevent electricity, generated by the standby unit, to flow simultaneously to both the customer's home or farmstead, and to the utility's system. This is essential to protect utility personnel and to prevent generator equipment damage. 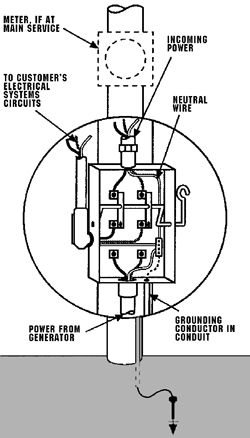 A three-phase generator would require a three-pole, double-throw switch. 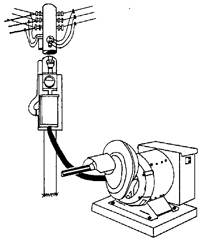 Some electric services use current transformer (CT) metering. This may require the use of a pole-top transfer switch. The operation of these switches is essentially the same, except that an extended manual switch lever is needed to allow the user to operate the switch from ground level. For small portable generators that serve a single freezer, well pump, or other appliance that plugs directly into the generator, a transfer switch is not necessary. But any time a generator serves loads through the permanent wiring system of the home, farm or business, a suitable transfer switch much be used. Typically, the transfer switch is located between the utility meter and the loads to be served. It should be within 25 feet or less of the generating unit for convenience and safety. If the location of critical loads are scattered among several outbuildings, the central meter pole may be the best location for both the transfer switch and the generator. If a critical load is located within a single building, the transfer switch (and generator) can be installed at the service entrance to that particular building. If only one or two circuits need to be powered during an outage, it is possible to connect only those circuits within a building to the transfer switch as illustrated in Figure 2. The size of the transfer switch is determined by the loads to be served. If a central meter pole location is used, the transfer switch rating must be equal to the size of the main service (typically 100, 200 or 400 amperes). If the standby system is designed to supply an individual building, or even a single circuit, the transfer switch will be sized to the total ampere rating of the connected loads. If an engine-driven generator with automatic start-up is used, the transfer switch is normally built into the automatic controls of the system. In this case, the transfer switch must be large enough to handle all electrical loads, size the switch to match the rating of conductors which supply regular power to the building(s) or farmstead. Consult a qualified electrician for assistance, and be sure your "new" wiring is inspected. All standby generators should be grounded using #6 solid copper wire and an 8-foot ground rod, which must be properly bonded to the electrical grounding system with approved clamp/connections to assure good electrical contact. Cover all generator openings with wire mesh to exclude rodent entry and potential damage. Keep these openings free of debris that might restrict the cooling of the unit.